Going on a Royal Caribbean cruise means taking a vacation on a cruise ship built to offer a very fun experience, both onshore and onboard. Over the years, Royal Caribbean has invested heavily in what it offers guests to do on its ships. While there are traditional cruise ship activities available, such as shuffleboard, swimming and the like, but there are lots of really fun active outdoor activities to do too. In fact, these activities are complimentary! Here is an overview of the fun outdoor activities you can try out on your next Royal Caribbean cruise. Perhaps no other onboard activity put Royal Caribbean "on the map" quite as much as the rock climbing wall did. 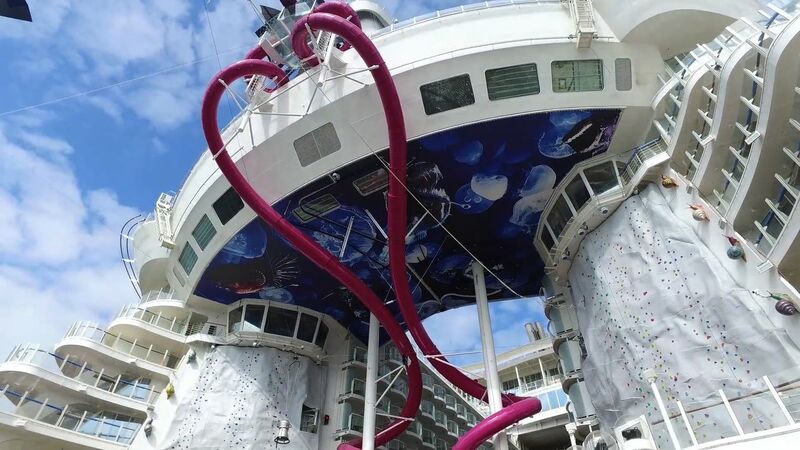 When Royal Caribbean introduced the first rock climbing wall, the guest feedback was so positive that rock climbing walls were added to other ships in the fleet and have become a staple of any Royal Caribbean ship going forward. The rock climbing walls come in different sizes, but they all offer different tracks that allow for different experience levels. It is usually open most of the day for kids and adults to enjoy. Royal Caribbean provides all the safety equipment that you will need, including helmets, harnesses and shoes. You just need to bring a pair of socks. Miniature golf is one of those activities that seems timeless. It is a fun activity day or night, regardless of age. On Royal Caribbean's larger ships, you will find a variety of mini golf choices that feature not just a fun game, but a great view of the ocean as a backdrop to the game. Royal Caribbean has revamped some of its mini golf courses with its newer ships and some recent refurbishments. The mini golf courses on Adventure of the Seas, Liberty of the Seas and Harmony of the Seas all have a new take on the traditional Royal Caribbean mini golf experience. In fact, Adventure of the Seas has a two-deck mini golf course. Playing mini golf onboard Royal Caribbean ships is free and no reservations are required. Much like the rock climbing wall, the FlowRider surf simulator also made a name for Royal Caribbean's ships by offering something as incredible as a surf simulator onboard a cruise ship. The self-contained surfing area pumps 34,000 gallons per minute and allows passengers to try stand-up surfing as well as boogie boarding. While the FlowRider experience is far more of a controlled environment than the ocean, learning to stand up (and stay standing up) on your surf board is not so easy, so Royal Caribbean offers lessons for an additional price. Both private and group lessons are available. The FlowRider has scheduled times of operation during the day when it is open to all guests for no additional fee. Guests must sign a waiver and there is a height requirement of 52" for boogie boarding and 58" for stand up surfing. The FlowRider is available on Quantum class, Oasis class, Freedom class and select Voyager class cruise ships. On Oasis class ships, guests can soar 9 decks above the Boardwalk neighborhood, stretching 82 feet from end to end. A very recent addition to Royal Caribbean's array of onboard activities are water slides. Unlike other cruise lines, Royal Caribbean did not offer large water slides on its cruise ships until fairly recently. Harmony of the Seas, Liberty of the Seas and Adventure of the Seas offer similar water slides known as, "The Perfect Storm." These slides offer a fast and thrilling ride that is certain to be a hit with families. In addition, Harmony of the Seas features an additional champagne bowl slide that swirls guests around as they make their approach to the end of the ride. Liberty of the Seas has the Tidal Wave slide, which has guests boarding a raft and sliding up a near vertical wall for a very fun effect. Water slides are available mostly during the day, and free for guests to enjoy as many times as they like. Speaking of slides, Royal Caribbean added one more slide to Harmony of the Seas, but this one features no water. In fact, Royal Caribbean wanted to create a truly thrilling experience with the Ultimate Abyss slide. Located on the aft of the ship, the Ultimate Abyss is more than 150 feet above sea level and offers side-by-side slides that send guests down 10 decks at a rate of 9 miles per hour. Guests board the slide by climbing stairs that lead directly into the mouth of a giant angler fish, where they get into a customized mat and then descend down the slide, traversing 216 feet of a multi-sensory tunnel. Guests can reach a speed of 9 miles per hour, and it is the kind of thrill experience unlike anything else at sea. The Ultimate Abyss is free and available for rides mostly during the day. 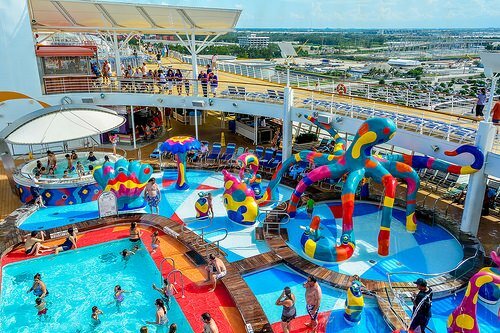 Royal Caribbean is a family cruise line, and as such, there are some great aqua parks for kids and their parents to enjoy together. These aqua parks have different names, but they all incorporate a large splash pad area with plenty of geysers, water cannons and spraying water fountains. Freedom class ships and Oasis of the Seas and Allure of the Seas feature the H2O Zone, which is a multi-colored splash area that looks almost like a progressive art form, until you see all the water spraying in every direction. There is even a swirling pool that kids can enter and turn-about to their heart's content. Royal Caribbean re-imagined the aqua park concept with its latest creation, Splashaway Bay. Available on Harmony of the Seas, Liberty of the Seas and Majesty of the Seas, this area features slides, water cannons, waterfalls and more in an "aquatic adventure park" for kids of all ages. 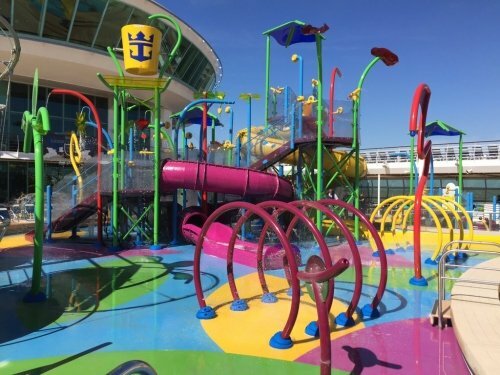 Royal Caribbean describes Splashaway Bay as, "a vibrant waterscape for kids and toddlers with sea creature water cannons, winding slides, a gigantic drench bucket and a multi-platform jungle-gym to keep everyone entertained for hours." On Radiance class ships, there is a small water slide and splash pool for young children to enjoy. Due to public health regulations, children in diapers, swim diapers, pull-ups or who are not COMPLETELY toilet trained are not allowed in the pools, whirlpools or H2O zone. Otherwise, kids are free to use the aqua parks as much as they like. 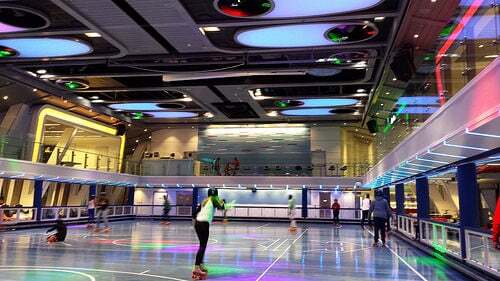 The sports court is a multi-purpose facility onboard Royal Caribbean ships that offer basketball, volleyball and tennis games. We have even seen dodgeball games on select cruises offered. It is the perfect place to get outside and join your fellow passengers and cruise staff in a game or two of sports fun. Guests can engage in pick up games, or enter into tournament style competitions that are organized by the ship's activity staff. Check the Cruise Compass for what is scheduled but Royal Caribbean will provide all equipment needed to play. Royal Caribbean is always looking to bring the "WOW factor" aboard their cruise ships and the idea of offering ice skating at sea is exactly one of those ideas. Whether you are a first time skater or a seasoned veteran, anyone can put on a pair of skates and join in. 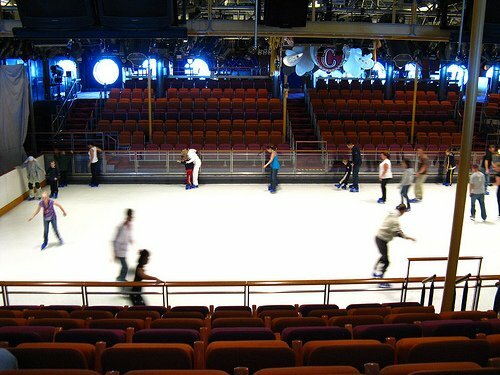 Free skates are offered throughout the cruise along with special time for advanced skaters. Skates and safety equipment are provided for free, although passengers may bring their own skates. Passengers must wear long pants and must sign a waiver to participate. Exercise for a lot of passengers is an important part of their cruise experience and on the sports deck, you will find a jogging and walking track that will allow you to get a few miles of exercise in. The tracks list how many loops are required to make a mile. Of course, the jogging track on Royal Caribbean ships come with a great view of the ocean! The track is split in half, with one half for joggers and the other half for walkers. There is no fee to use the track and you may use the track anytime. Personal fitness has never been more popular, and Royal Caribbean offers a combination of complimentary and paid fitness classes. Guests can check their Cruise Compass once onboard to see the options available, but there are definitely a few classes to choose from that will cost you nothing extra. The complimentary fitness classes have included courses that focus on stretching and getting great abs. A full list of courses available will be found in the Fitness Center onboard the ship. There are usually sign up sheets, where guests can lock-in a spot for them. In addition to the classes, the Fitness Center is also complimentary for guests to use, with a variety of exercise machines, treadmills, free weights and open space for self-lead exercise. Royal Caribbean's Fitness Centers are quite impressive, especially on its newer ships. It is a large space with lots to offer guests of all levels. The Fitness Center is open most hours of the day and night, with just a few hours of actually being closed late at night. Access to the Fitness Center is free, although there are some classes that come with an additional charge. Have you ever dreamed of skydiving but never pursued it primarily because you would have to jump out of a perfectly good airplane? Yup, me too. That is why Ripcord by iFly is such a great option. Similar to the FlowRider, this is a skydiving simulator, where guests enter into a vertical wind tunnel and with the assistance of an instructor, get the sensation of skydiving. Guests don a special "wind suit" and after some instructions on the proper form, have their chance to experience a sky dive. Guests on Anthem of the Seas and Ovation of the Seas are able to reserve a complimentary session via the Cruise Planner during their cruise. They also must sign a waiver. The sports court has always been a popular spot for physical activity on cruise ships, but Royal Caribbean re-imagined what this space could be on its Quantum class ships. While not outdoors, the SeaPlex allows for guest to do so much more than just what a sports court can, and it is not subject to weather conditions. Bumper cars, roller skating, full-size basketball court, circus school and more at Seaplex, the largest indoor active space at sea. There is even an X-Box lounge, for guests to play video games with friends onboard and online. At night, the SeaPlex can transform into a party zone, complete with floating DJ booth overhead. SeaPlex is available on Quantum class ships. Just like the sports court, SeaPlex is open throughout the day and has no charge for its use. What is your favorite physical activity on a Royal Caribbean cruise? 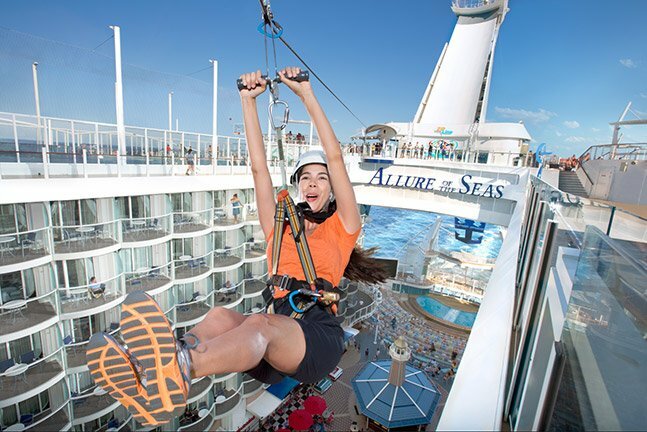 Are there certain activities you think are must-do for someone new to Royal Caribbean? Share your thoughts in the comments below!